One topic for all modifications on my Hanse 320. Sounds better to me than all seperate posts I did. 10/ Lot's of new blocks for inf**kes, barberhaulers etc. Next posts on this topic will show the modifications for further reference and other 320 owners, maybe it's helpful for someone else. Next year - maybe this year already - I would like to take part in regattas and therefore every experiences are welcome! Ordered a carbon spinnaker pole today. Lenght 395 cm, weight around 3,15 kg and diameter 60mm. Good for spinnakering and good for the genoa when not racing I think. Okay, the padeye is ready. A little challenge, because the aluminium plate was not in the middle/center of the boat and was also smaller than the drawings said it should be. My guess it's around 6x6 cm instead of 10x10. So, solved it by mounting the padeye on a teak placeholder. Next step is to mount a mastrail with spinnaker pole eye. Thinking of a 25mm rail of Pfeiffer marine, around 2 metres and a Pfeiffer Marine spinnaker pole eye for that rails. Okay. The stuff delivered. Lewmar size 1 NTR torlan ball genua cars with toggle & beckets, one control block, end stops with single control block, HTX blocks and some other stuff. The size one car with torlon balls is 71mm wide, and fits exactly close to the windows. The construction prohibits that the car can fall to the window, it only can fall on deck. Therefore you have a port- and a starboard car. So, this works. Next steps: drilling some holes in the footrail for mounting the blocks for barberhaulers and mounting the trimlines for the genoacars. I wonder if the sheet will not rub at you Gelcoat at the corner visible (the edge of the cabin superstructure). The other disadvantage is that the Sprayhood is not usable in this configuration. 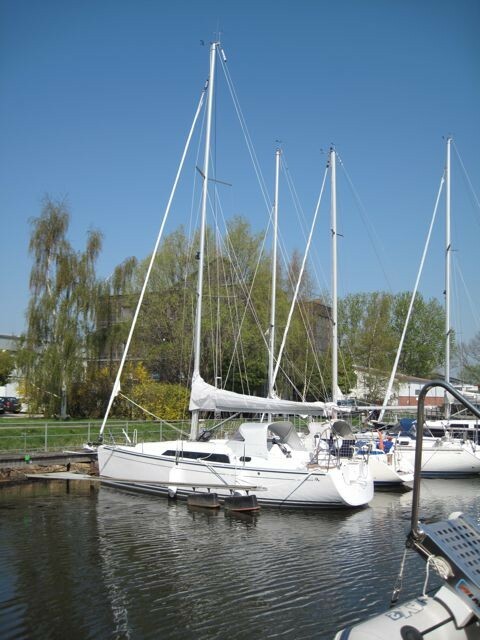 We do also have the Genoa tracks installed and we you them to sheet the selftacker when sailing at 90°AWA and more. We are thinking to put a padeye for a blick aside of the reling stenchion - it looks like there is a reinforcement - meant for another stenchion for a reling door. Got the new custom made, carbon spinakkerpole! Really nice made, with heads of alu made on a CNC machine, looking awesome. You'll need lots of blocks, line handlers and stops when spinakkering and using the adjustable genoacards. Furthermore, I'm mounting the barberhaulers on the footrail of the Hanse. Almost everything is now done, just have to mount cleats for stopping the genoacars and stops for the barberhaulerlines. Can you pls. explain, how you have supported the sheet eyes on the deck? Did you find any supports in the deck struckture? The same is being done for the spinnaker sheets. They are going to a 70mm Lewmar block mounted on the clamp and are at the widest part of the boat supported by barberhaulers. On the barberhaulers ther is mounted a friction ring where the spinnakersheets are going through. One end of the barberline is fixed mounted and the other end is going out and back through the barberblock and feeding back to the aft of the cockpit. Hereby I've got a 2:1 delay. The downhaul of the spinnakerpole is a continue line which travels through three blocks on the foredeck. This gives the ability to have a 2:1 delay and trim the downhaul on as well the left- as right side of the boat. There is not a lot of 'body' to drill the holes for the camcleats in here, so be aware that you drill the right holes, not too wide or it will come loose. My guess it's only max 3mm here. The spnnakerpole lifted. The blue line for the self tacking jib will be the topping lift for the pole.